Harry Potter and the Deathly Hallows, pt. 1 is a somber, moody setup for the final movie in the brilliantly successful series. The film is not meant to stand alone, of course, so there are more buildups and setups than revelations or conclusions. And while director David Yates tends to use a switchblade for violence where the book used a sword, the character developments, tension and foreboding are present and compelling. Like the Half-Blood Prince before it, the newest installment in the Harry Potter series is filmed (by Eduardo Serra) even more beautifully than its predecessor. Leaving the school grounds of Hogwarts allows for a vast array of breath-taking locations and mood setting climates. Along with the cinematography, the acting has improved. Having grown to young adulthood as these very characters, Daniel Radcliffe, Rupert Grint and Emma Watson deliver performances as smooth and natural as any method actor could hope to achieve. The frustrating aspect of the film is that it is, of course, incomplete. A climactic “part 2” will be released next summer. Harry, Ron and Hermione are no longer Hogwarts students. 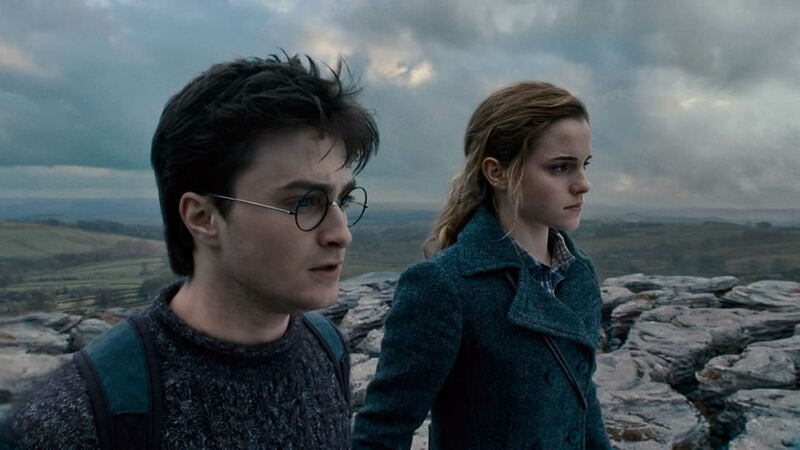 They are alone, out in the world – the Muggle World – as they blindly search for Horcruxes and dodge Voldemorte’s henchmen. (If you don’t know what a Horcrux is, than you should probably hold off on seeing this film until you’ve seen the others. ) More than in any of the other films, the three young actors are asked to carry the film. The veteran cast of famous British actors that provided such a solid base for the first films are largely absent. Thankfully, though not surprisingly, Radcliffe, Grint and Watson rise to the occasion. Very notably, many of the ticks and facial expressions that were becoming “go-to” looks have all but disappeared. Grint no longer falls back on the big, crooked grimace that got so many laughs when he was younger. Radcliffe has loosened up, both facially and physically (though he still dances like a robot). Watson still frowns and shakes her head quite a bit, but she has given Hermione a whole array of traits that go beyond even what Rowling included in the books. Much of the story shown so far is about the trio’s struggle to define themselves: What are their roles? As Ron says in the film, Harry may be the chosen one, but it’s bigger than that. Is Harry still their leader when he doesn’t seem to know what he is doing? There are no professors, no Dumbledore, to advise them, so they argue and stumble as they make the awkward turn from children into young adults. And then there are many chase scenes, battles and close calls, and while their time alone in the wilderness is well covered, the movie never lacks for momentum. Just as the characters constantly “disapparate” and jump from location to location – either in escape or pursuit – the story does so as well, leaving an ungrounded feel to the turning of events. Gone are the long takes of the strong halls of Hogwarts, or the quiet, impressive stares from professors. This serves the story quite well, as the heroes have lost that base of support and do not even know themselves where to go next. There is one blemish on this otherwise nearly faultless effort. Some of the more emotional scenes from the book are blunted in the movie. During one chapter in the book, there is good reason to believe that their long time friend Hagrid has died. This is completely skipped for the sake of time. Two other events are more difficult to understand. When Hermione is tortured by Bellatrix LeStrange, it is supposed to be excruciating, and Harry and Ron, trapped in an underground cell, are tormented by the sounds. Yet Yates has chosen to cap the screaming and show almost nothing of the event itself (other than the poignant but rather small physical aftermath), diluting our hatred for Bellatrix and missing a chance to highlight the level of evil that is looming over their heads. Almost immediately after, an important returning character is killed. This moment is confused by slow-mo and editing and falls into anticlimax when in the book it is a near breaking point for Harry. These last scenes close out the film and could have left the audience with quite an emotional stinger. On the lighter side, there are two particularly excellent bits of animation in the movie. The first is a long scene with a closeup of Creature, the house elf, who is a CGI character. The face and skin are so fleshlike and realistic that it seems that we are a very small step away from not being able to tell which characters are real and which are not. I think that the Academy Awards will recognize this achievement. The other masterful display is of more traditional animation. When Hermione reads the fable of the Three Brothers who are given the Deathly Hallows, the film moves into a stark, jagged type of drawn animation with fierce figures and surreal movement. It is an energizing scene and lends a little more mystery to a world with which we’ve become largely familiar. As a real fan of both the books and the movies, I can say that I am happy with this new film, yet anticipate more from the last one. The book was one continuous story, so the breaking into two parts feels unnatural – but perhaps that is simply impatience on my part. This entry was posted on November 20, 2010 by Ian Kay. It was filed under Harry Potter and the Deathly Hallows part I (2010) and was tagged with harry potter and the deathly hallows.